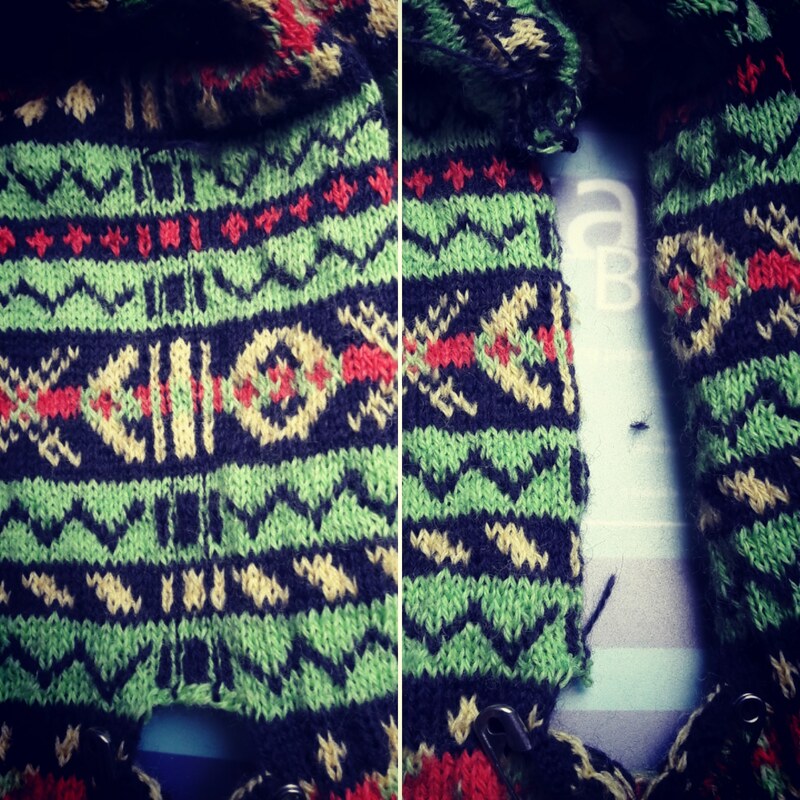 Today I want to share my experience of knitting my Vaila cardigan from The Vintage Shetland Project by Susan Crawford. 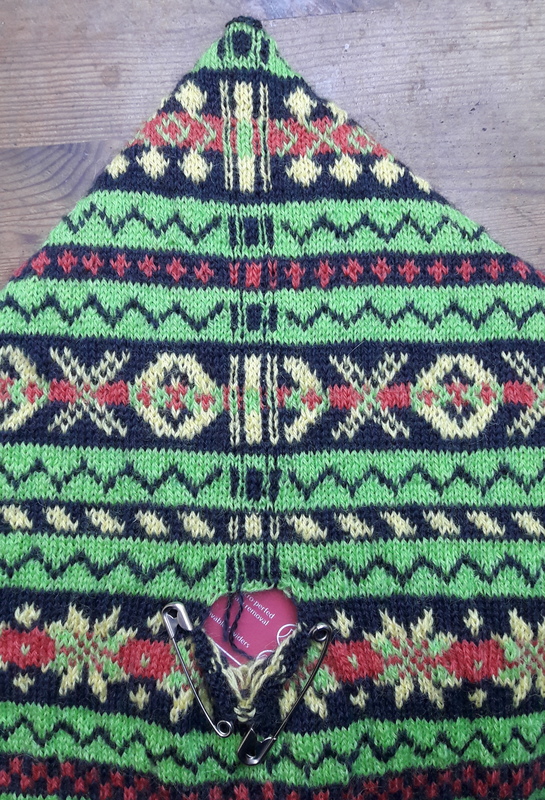 This was my first all over colour work garment with steeks, so was both a joy to knit and a definite learning experience. I’m not entirely new to colour work. I knitted the samples of the Twageos hat and Stromfirth Socks for the book, along with a few lace sleeves for other patterns to help finish up samples. However, neither hat nor socks required steeking. 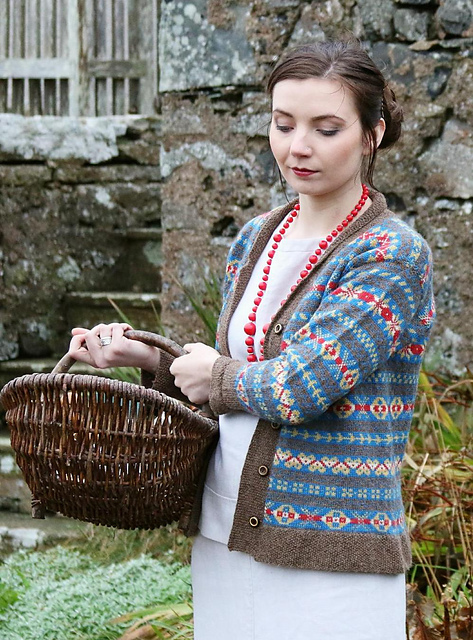 The original Vaila cardigan is a 1930s garment, emerging from Shetland’s response to the adoption of gender neutral fair isle garments by fashion forward active young people at that time. 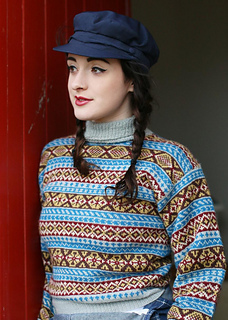 Susan suggests that such all over gender neutral garments were pivotal in the health of the knitting industry (albeit in favour of stranded colourwork rather than lace) on Shetland in the interwar years. 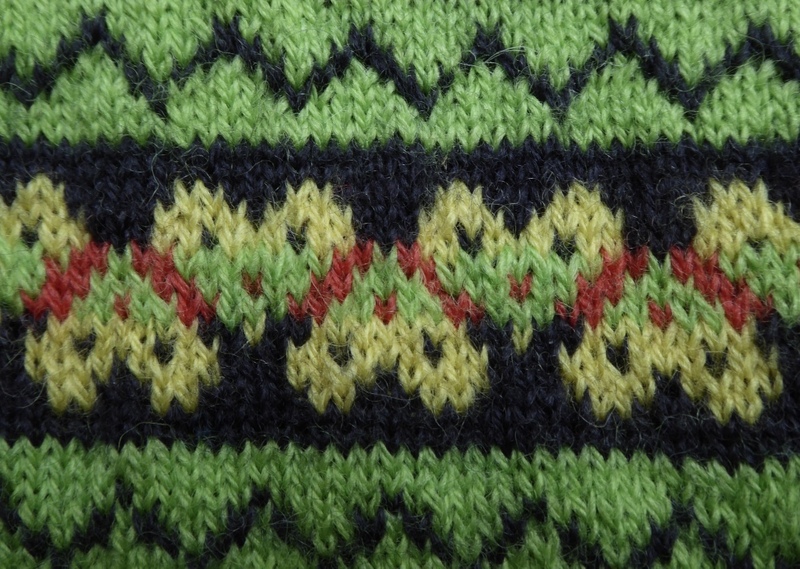 Key influences were wider fashion, particularly Chanel, and Royalty, with Edward, Prince of Wales setting a trend by wearing an all over fair isle to play golf at St Andrews. The original Vaila combined a natural moorit (caramel coloured) yarn with yarns dyed red, blue and gold, using madder, indigo and onion skins. I shook things up a bit by changing the colour scheme for my Vaila. 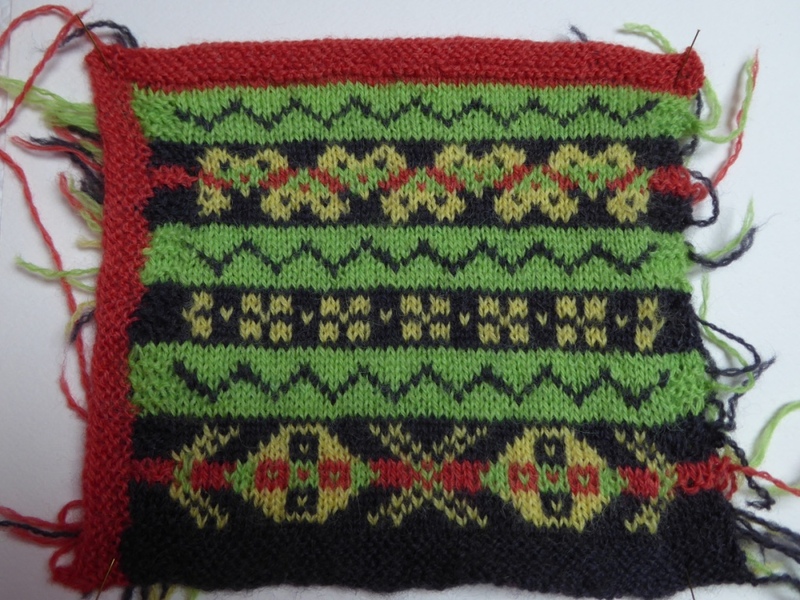 As a result, I spent quite a long time swatching and trying to work out how I could combine the colours of Fenella, that I wanted to use. 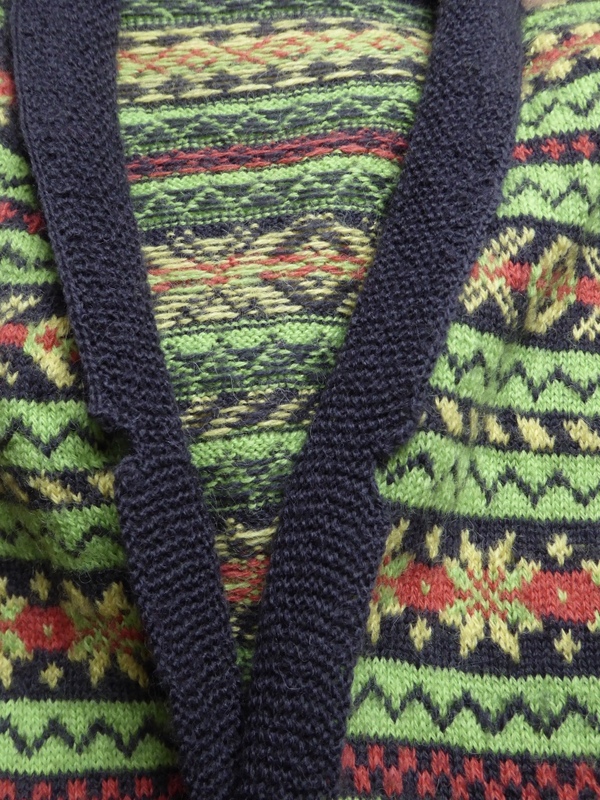 Fenella is the yarn that Susan designed to enable knitters to recreate these vintage garments. The colours I had chosen were quite strong colours which presented a particular challenge in balancing them. Here are some, but not all, of my swatches – the less successful ones were ripped back rather than cut and blocked. 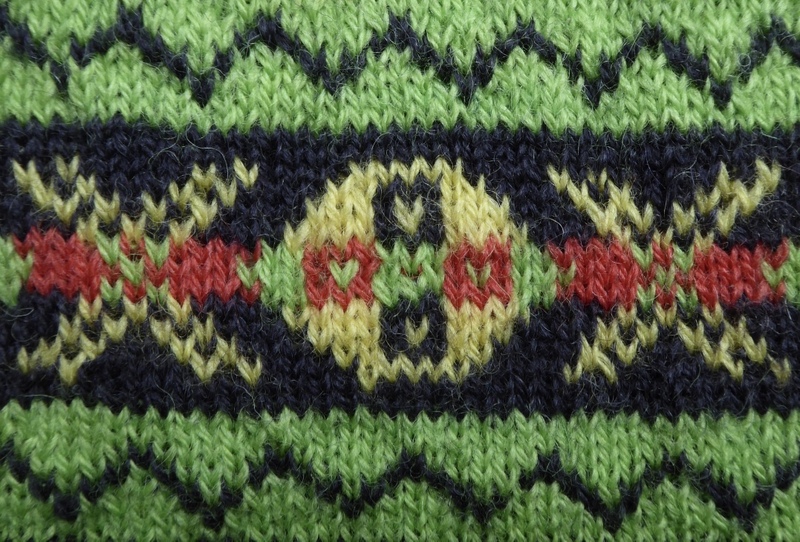 I was attracted to Vaila by both the style of the garment and the choice of motifs. Vaila has wonderful OXO motifs, the heart motif and an eight pointed star. The OXO is pretty iconic and I love that each iteration of it on this garment is different. 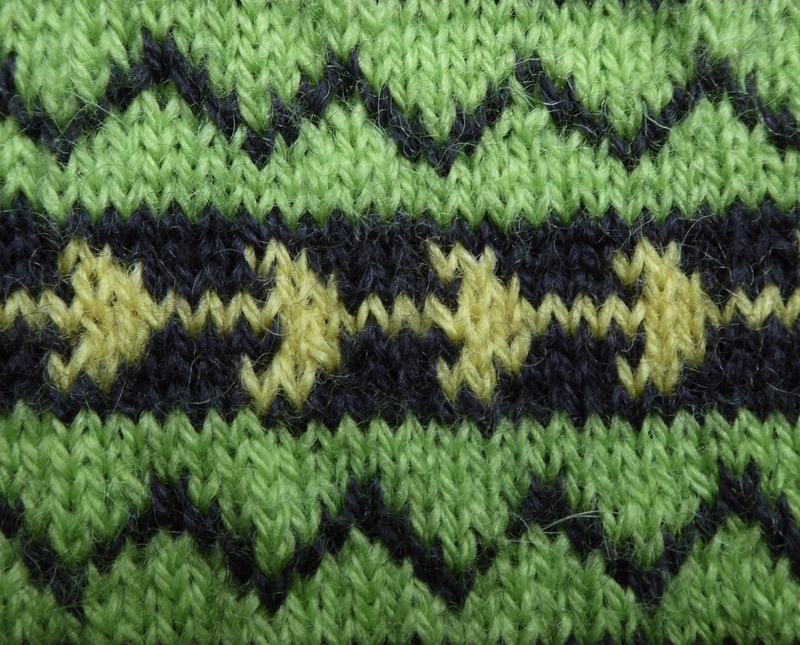 I also love the strong, bold geometry of the OXO motif which I think worked especially well in my choice of colours. 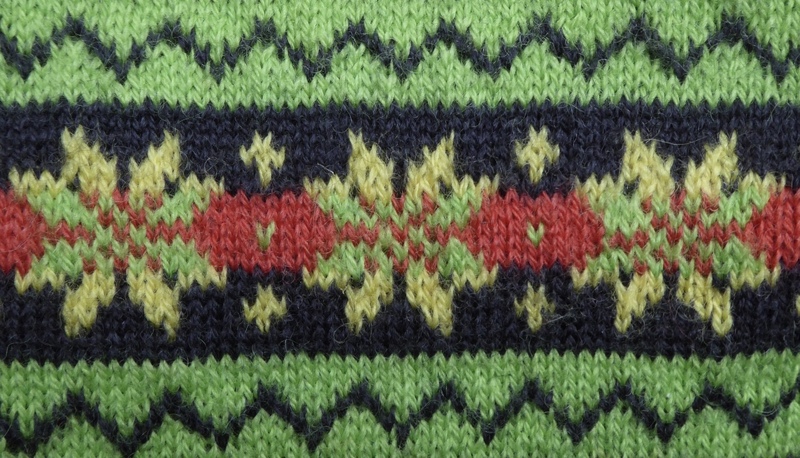 The 8 pointed star or Norwegian Rose is an interesting choice as this garment was knitted at about the same time as the big boom in in the Norwegian knitting industry in the interwar years, suggesting an earlier exposure and influence of the neighbouring tradition that was to really take off after the second world war. 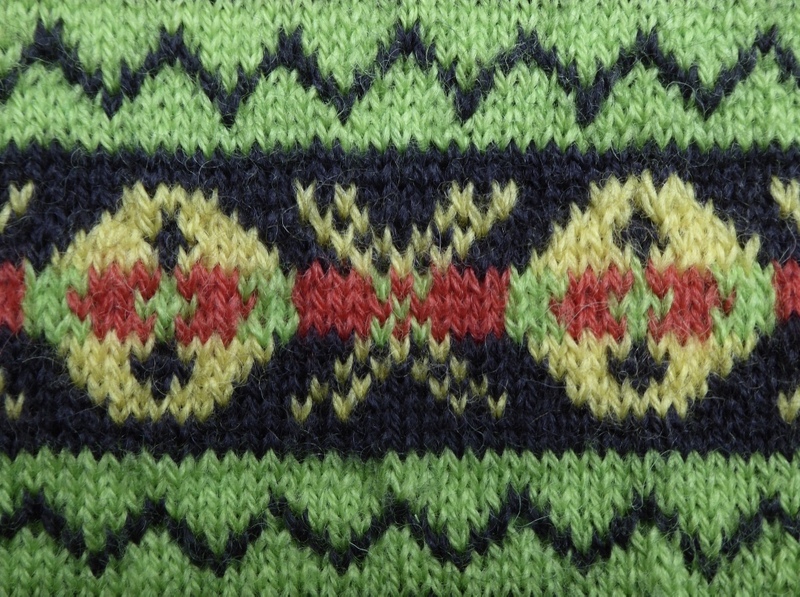 The smaller motifs or peeries in the pattern really helped speed this knit along, both in their simplicity and in the desire to get through them quickly to get back onto one of the larger motifs. 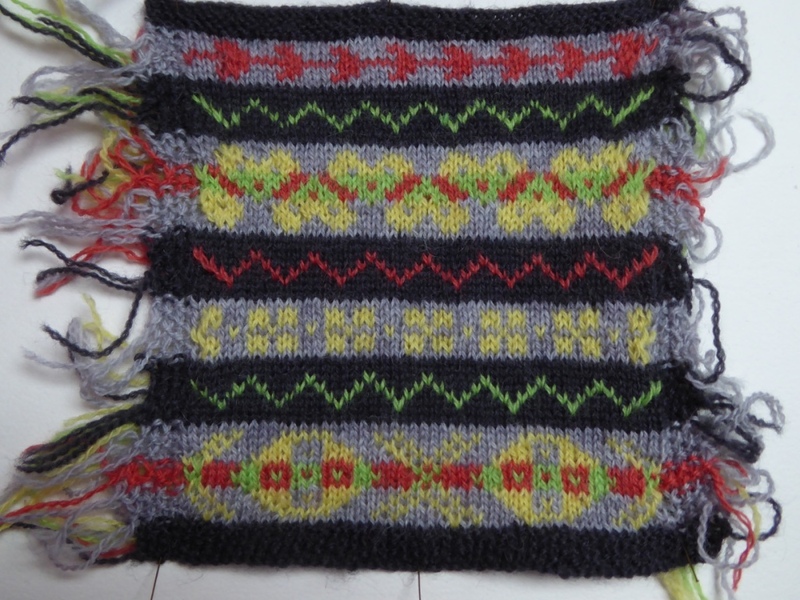 However, it is here that I learnt an important lesson for my ongoing colourwork knitting. Whilst swatching a lot of colour combinations, one combination I decided on without looking back at my swatches as carefully as I could have, was the atomic red on a charcoal background for some of the smaller peeves. This combination makes the red look like a completely different colour than when it is worked in combination with the the colours where it takes on a more orange softer hue. However, the interest in this garment isn’t simply in the colour work although this could steal the show. 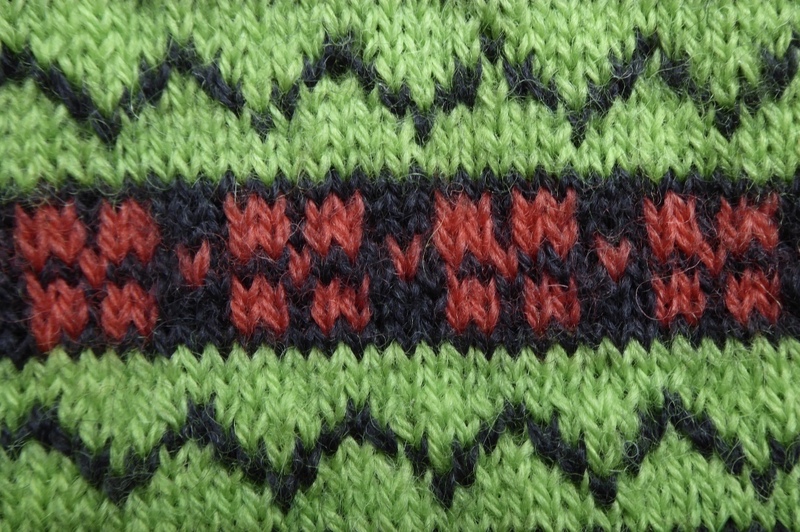 As much as I find moss stitch a chore – I do love the effect of the deep moss stitch bands at the hem, cuffs and button bands. The shaping of the button band, is similar to that you’d use for a shawl collar, although I’d suggest Vaila is a little more stylish as a result of the short rows being used to add lapel shaping. I’m sure I would have enjoyed this more and perhaps added even more depth here if I wasn’t working the collar very late on the Thursday night ready to wear it at Edinburgh Yarn Festival on the Friday. The other casualty of my race against time to finish and wear was the button loops. As with the original, not having to worry about button placing did speed up knitting the button bands. However, it has also meant that to date I haven’t gone back and added these. I’m not overly concerned about this though. 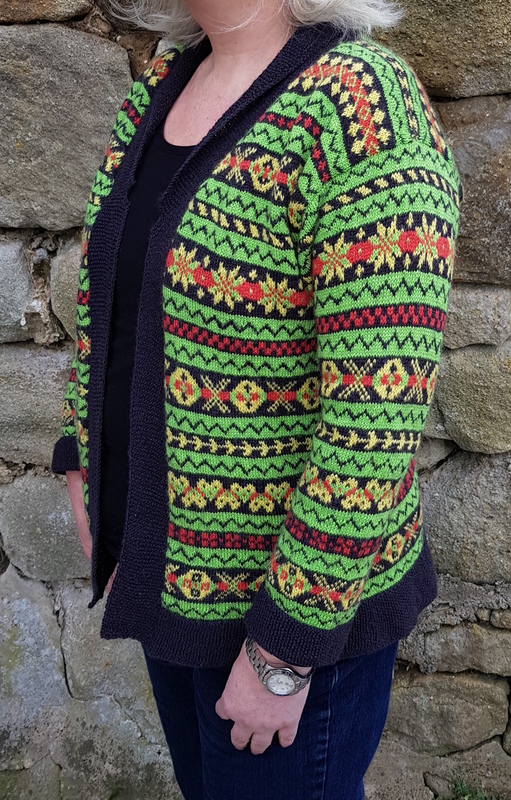 One of the reasons for choosing this as my first knit was that I simply don’t wear sweaters at the moment – menopausal flushes mean my woollens have to be ready to come off and go back on pretty speedily with the minimum of wrestling! Strange though it may sound, a couple months after completing this, my first steeked garment, now that I come to write about it, the steeking was the least interesting bit of the whole knit. It was actually pretty straightforward. I started with the sleeves as these were the smaller steaks and involved less picking up than around the front. I slipped a notebook in between the 2 layers of fabric so I didn’t accidentally cut through the back and cut up through the two stitches in the centre of my steek stitches. You can see in the picture my under arm stitches had just been slipped onto safety pins before I’d cast on the steek stitches, nothing particularly fancy or complicated there. All this said I did have a rather sinking feeling in my stomach whilst doing it. This visceral response did surprise me. 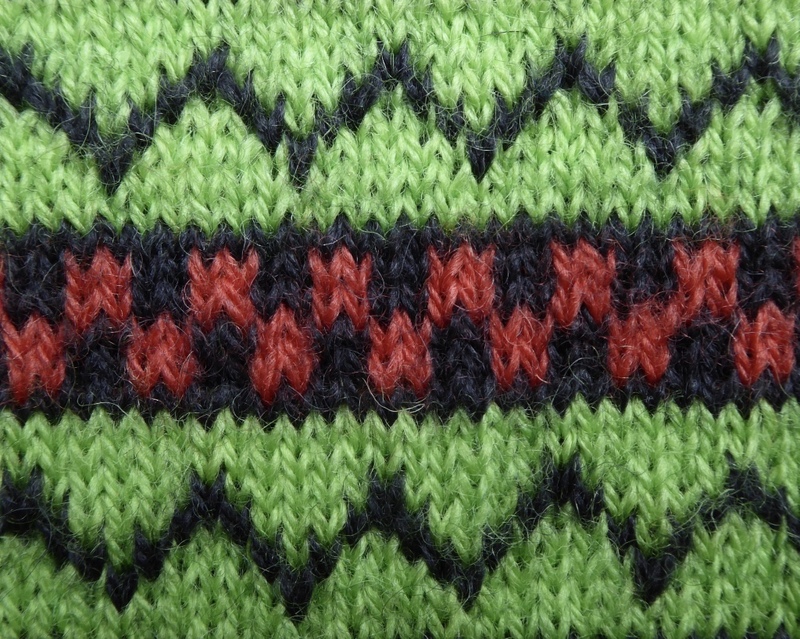 The very structure of knitted fabric means that unless I did something seriously crazy, like cut horizontally rather than vertically (and why would I? 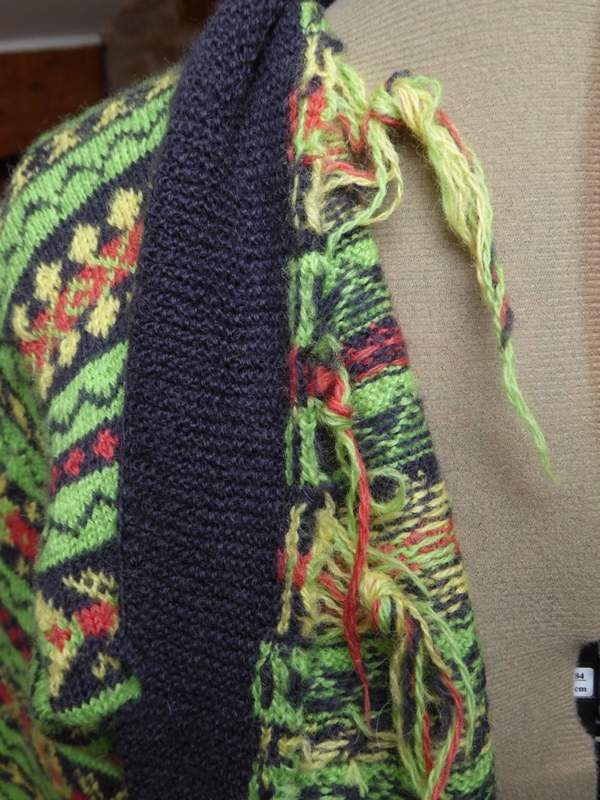 ), my knitting wouldn’t ‘accidentally’ unravel. But despite knowing that, it still felt a bit weird and I was a little wary when handling my knitting after making the first cut. 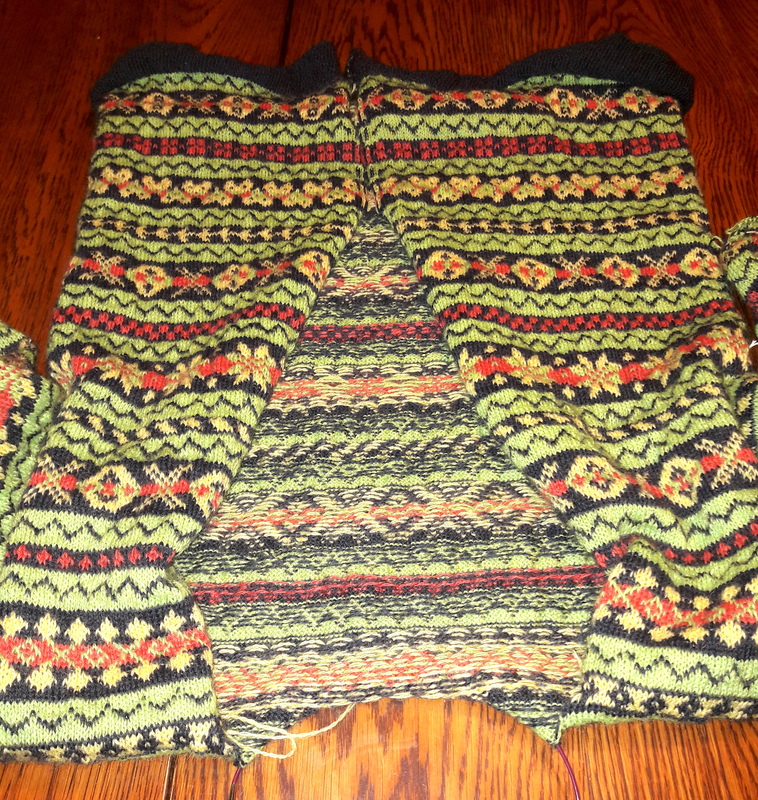 However, by the time I’d done the second sleeve and knitted them both and not found them mysteriously detached after all the twisting and turning of knitting top down sleeves onto a full body, when I got to the centre steek I had more confidence in the whole process. As my collar and front bands were completed very late in the day, or night depending on your perspective, a lot of the ends weren’t finished off very tidily but I don’t think anyone noticed! 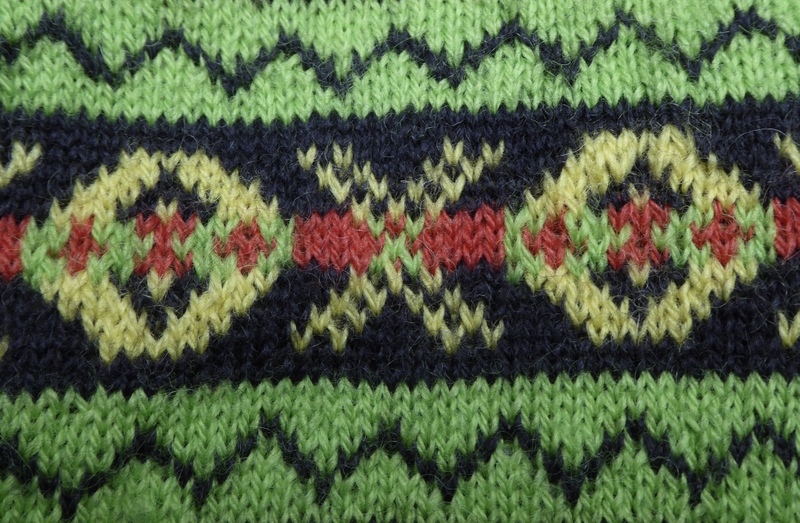 As well as the new skills I’ve learnt in this project, one thing it has taught me is that Fair Isle or stranded knitting is fun, addictive and very forgiving. 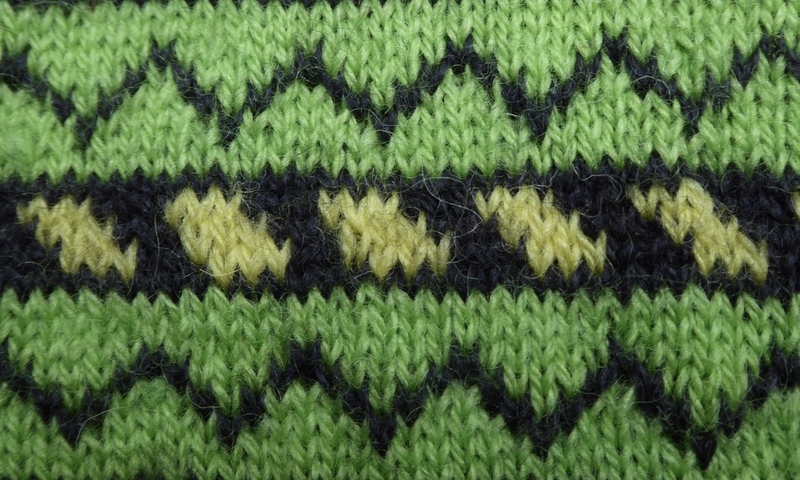 You can fudge a lot in all that colourwork, or in those little noticed rest rows between the more showy motifs, which is perhaps just as well as my next project on the needles from the Vintage Shetland Project is Yule, a fitted, cropped, high neck sweater which I’m turning into a longer length cardigan… But I am sticking to the original colours this time – well almost! I’ll come back and let you know how I get on.